The Cartoonist made me waste another night. Yes, it's true. It's all his fault. He had a link to a Grateful Dead archive. I checked it out and was undone. It was much more than the Grateful Dead. Much more! Welcome to the Live Music Archive. etree.org is a community committed to providing the highest quality live concerts in a lossless, downloadable format. The Internet Archive has teamed up with etree.org to preserve and archive as many live concerts as possible for current and future generations to enjoy. All music in this Collection is from trade-friendly artists and is strictly noncommercial, both for access here and for any further distribution. Artists' commercial releases are off-limits. This collection is maintained by the etree.org community. The Live Music Archive is but one part of a larger site (Internet Archive), which has movies and text, which I will search some other day. It's the Live Music Archive that caught me last night. They have 1764 Grateful Dead shows from 1965 to 1995. The Grateful Dead pioneered a strange concept. They allowed taping at all their concerts — that was the big reason that they were such a successful tour band. They never had any big hit records. The word got out through the trading of tapes. The Grateful Dead was a jam band. Every show was different and each song was never played the same. Improvisational rock and roll. The Grateful Dead wasn't the only jam band. Phish used taping to spread the word. But Phish is to be no more. One of the early successes of the Internet was The Well. It became a huge success when the Grateful Dead tapers discovered it and used it to trade tapes. The Dead allowed non-commercial taping. You could trade but not sell. It was, and is, a huge community. But the quality of the tapes often left something to be desired. You always tried to get close to the original tape but often it was generations removed with a loss of quality. Boy, how things have changed. The Live Music Archive has several formats available for downloads. Some are MP3 (64Kbps and VBR) but the most common format is Shorten. It doesn't seem to be very common outside of the trading community but it seems to be one of the standards for tapers. It doesn't compress nearly as much as MP3 but it's big advantage is that it's lossless. Unlike MP3, no data is lost on compression. And combined with modern *very high quality* portable portable recording devices, the sound is awsome. Unfortunately, this really only works for those with broadband. Dial-up is way to slow for these big files. etree.org is behind this. Their site has links and directions on how to download and convert. I use Shorten to convert the Shorten files to WAV files, which then can be easily burnt. There are a lot of other options so check out the etree.org site. 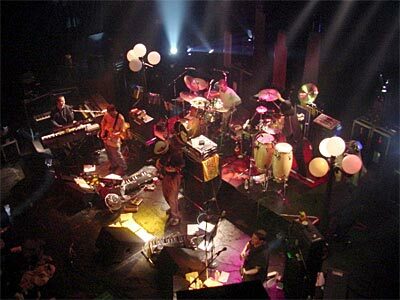 I'm listening to the first set of Bela Fleck and the Flecktones, February 11th, 2003, at Pompano Beach Amphitheatre. The sound quality and musicianship is incredible. It's psychedelic banjo jazz. But I've been a Bela Fleck fan for some time. The Live Music Archive lets me check out some other jam bands that I've heard of and not heard of. One of the latter is what I was listening to last night. Every day more and more people are tuning in and turning on to Umphrey’s McGee. And for good reason. Like true sons of the American Midwest, Umphrey's McGee has risen to the upper echelons of the improvisational-rock scene through their seamless compositing of diverse musical influences, from progressive-rock to metal to funk to folk to jazz-fusion to classic song-based rock-and roll, all woven together with infectious melodies, thought-provoking lyrics, pristine harmonies, blistering musicianship, and rollicking grooves that keep dem bones a-shaking throughout the course of their patented sonic sagas. Devotees of “all cool music,” the band identifies The Beatles and Led Zeppelin as primary influences with a reverence the members describe as “biblical.” They also share a love for the music of Yes, Gabriel-era Genesis, King Crimson, the Mahavishnu Orchestra, Miles Davis, and Jaco Pastorius. Their own playing and writing reflects these influences, yet maintains its own contemporary originality through a diligent avoidance of clichés (both musical and lyrical) and a willing patience to wait for the freshest expression of an idea to emerge. Sometimes song ideas sit dormant for years before finding a place in the band’s vast repertoire. Using 8-bar segments and progressions (building blocks they have dubbed “legos”), primary songwriters Jake Cinninger and Brendan Bayliss construct their songs piecemeal and with the active participation of their bandmates. All arrangements are collaborative. Lyrics, too, are collected over time and groomed to be thought-provoking and open to interpretation. This is a band that likes its audience to think while they’re dancing. Solid songcraft is the first crucial step in that process. Last night I downloaded the first set of Umphrey's McGee, December 31st, 2002, Vic Theatre, Chicago, IL. They don't mention it, but there is a Phish influence. Definitely worth checking out. This show was three sets and takes up 4 audio discs. The second set has covers of the second side of Abbey Road. Wonderful! Only 13,286 shows to go. Except that they keep adding to the list. I just checked and it's up to 13, 294 shows. I'd better start downloading. Here are some that I will be checking out soon: Aquarium Rescue Unit (14), Bela Fleck and the Flecktones (78), Big Head Todd and the Monsters (14), Billy Bragg (41), Grateful Dead (1764), Leftover Salmon (98), Little Feat (64), New Riders of the Purple Sage (17), Of A Revolution (268), Rusted Root (26), String Cheese Incident (652), Umphrey's McGee (438), Yonder Mountain String Band (265), and Zero (120). There are many other archives out there in Internet land. Other bands and more music. These are all bands that are best seen live. If you like what you hear, go see them. You will be amazed. So much music, so little time. I forgot about moe. (472).